There has been a deluge of seasonal greens on #healthfooddesivideshi as my garden is flooded with spinach and fenugreek greens. Although I have been traveling almost back to back since the first week of February, I found comfort in the greens that the garden treated me with whenever I was back home.There is some baby bok choy and some kale too but these remained stunted during the harsh winter and then they suddenly started bolting. So the best use was to chop them up and stir fry or mix with lentils and make fritters. But to be honest I was using them in everything possible, the everyday dal or khichdi, the quick soups and even in flat breads like this thalipeeth. You wouldn't want to waste any home grown organic produce once you know how difficult it is grow food. 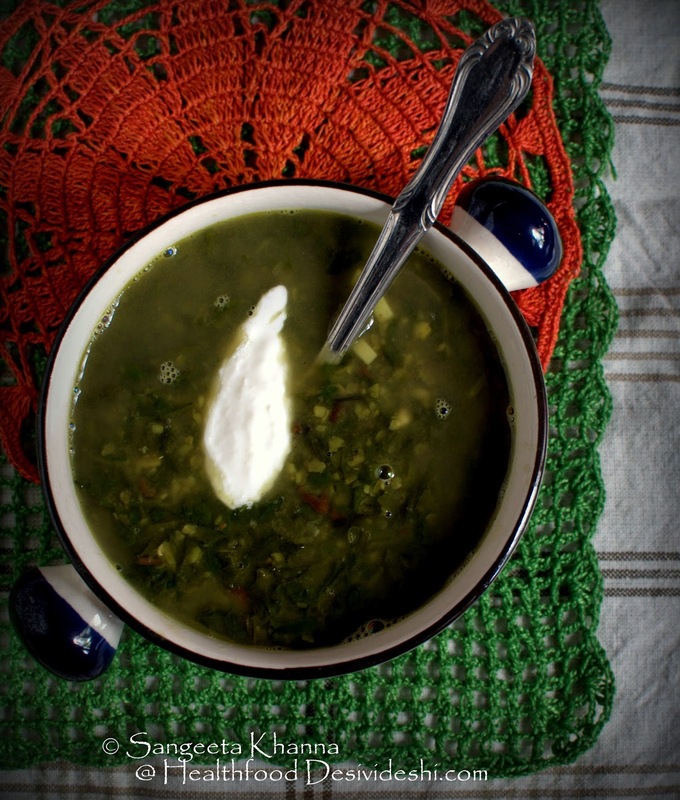 This mixed lentil spinach soup topped with sour cream is one of my favourite meal these days. Now you see I cannot get bored with spinach. Cooking with home grown spinach is always fun. It helps that I love green vegetables and I assure you even you would love them if you find the best quality available in your part of the world. Cooking them well is also important but that is a skill everyone must have if one wants to know what one is eating. Right? Including the greens is not as difficult as it sounds to many. I know many who dread cleaning and rinsing the greens to get rid of the dirt and then chopping them for hours. The easy way is to buy in bulk when you have time, clean them well and steam to compress and then freeze in portions. The frozen greens are very easy to chop. I do the same with all the garden produce and now I have frozen greens for a couple of months. Using the fresh or frozen greens for breakfast wouldn't be a very common thing to many, including my husband who loves his pancakes or porridge for breakfast but one can make healthy breakfast with them in a jiffy. Being prepared is the key, I prefer soaking the lentils overnight and it takes about 15 minutes to cook breakfast for 2 including the chopping and blending time. 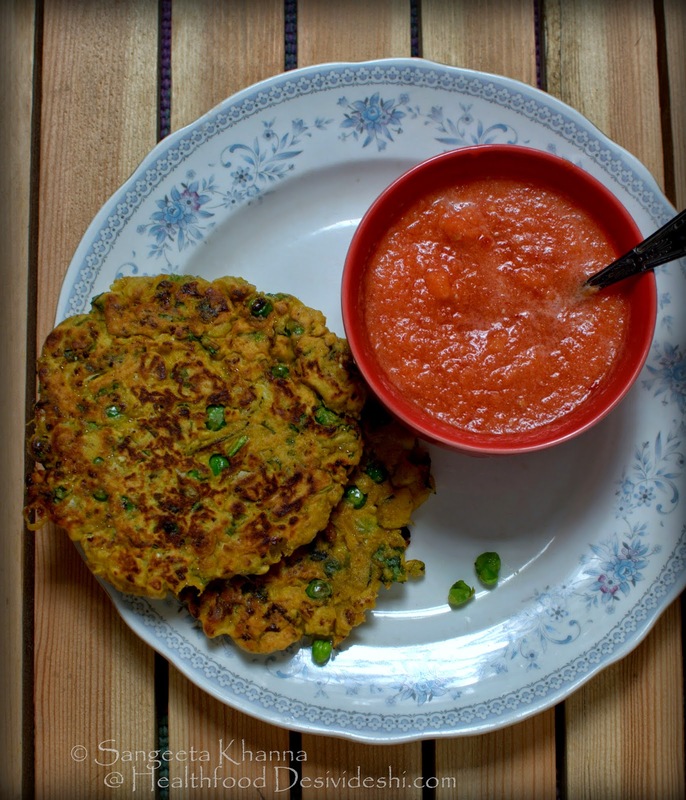 This is red lentil and spring onions from the garden, both make a wonderful spongy pancake that can be enjoyed with herbed yogurt of any other dip you wish. Note the ratio of greens to lentil paste and how the mix looks more green and less pink. 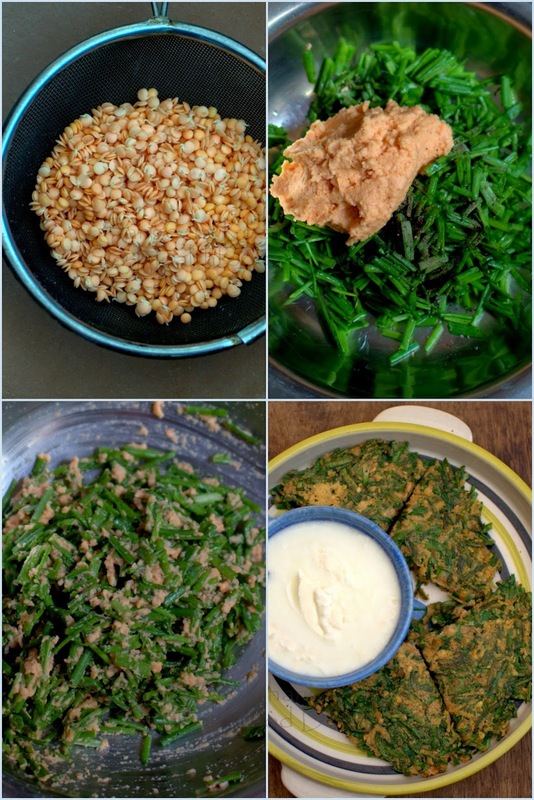 Grind the soaked lentil along with everything except the ghee and spinach. Do not add water. Mix all the spinach in the lentil paste, massaging it softly so the spinach gets almost blended with the paste. You would need to quickly shallow fry the fritters after mixing as it releases water after mixing. Make small portions of the mixture, spread on the pan and shallow fry on both sides as you would do with small pancakes. I prefer cooking these on low flame, often covered with a dome lid to make them cook faster but you can drizzle a bit more ghee or oil to cook them faster. If you want lesser amount of ghee being used you have to cook them on low flame. Serve hot with any mild chutney, salsa or dip that you like. 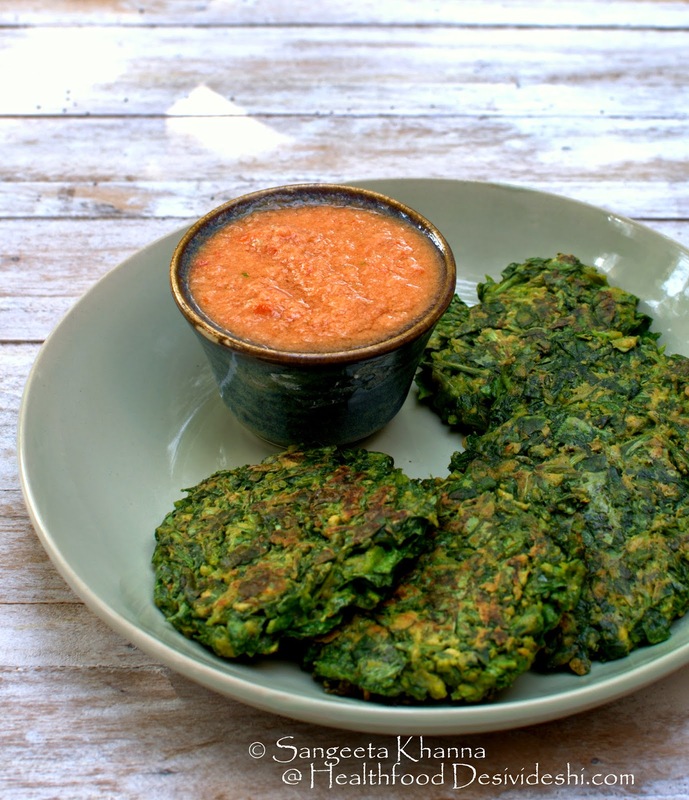 For these spinach fritters I made the most common and quick chutney that I make. A cup of red ripe tomatoes, 1 clove of garlic, 2 dry red chillies and salt blended together to make a chutney. Sometimes I add coriander greens or mint in the same. 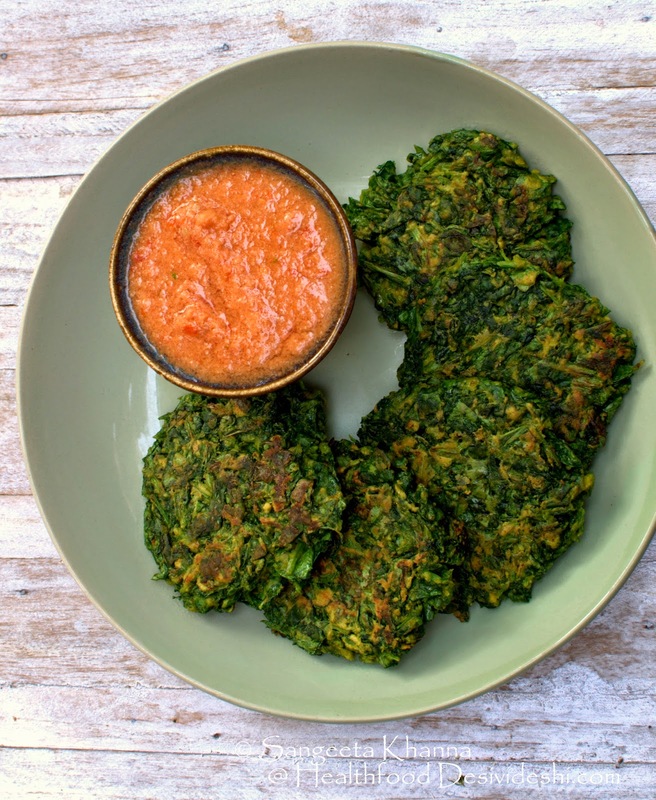 A similar kind fritters I made with a mix of kale and some baby bok choy mixed with red lentil paste. The procedure is similar, you can adjust seasoning and make small or big fritters. Making them thinner would help in faster cooking but they taste good any which way. The above bowl of dip is very interesting. It is a sweet and sour dip with a kick of roasted red chilly flakes (or just lightly roast a couple of dry red chillies over gas flame). This is actually made of sun dried pomegranate seeds. Blend together 2 tbsp of good quality sun dried pomegranate seeds, 2 tbsp of roasted sesame seeds, 2 large ripe char grilled ( on gas flame) tomatoes, roasted chilly or chilli flakes to taste and salt to taste. Serve as desired. 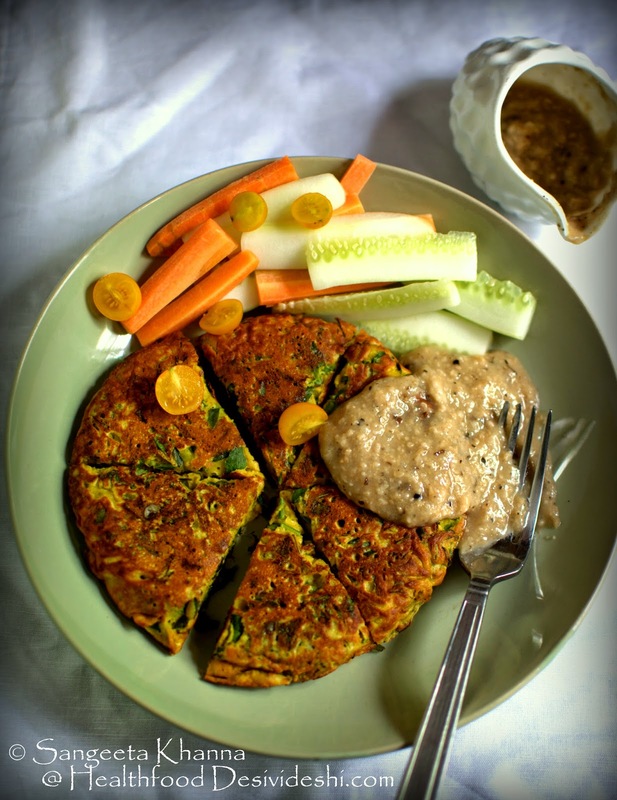 Another such pancake is made with green peas included in the lentil paste. The one below is made with home grown fenugreek leaves, some green peas and chopped onions. The dip with it is the most convenient tomato-garlic-red chilly blended together with a dash of mustard oil. The leftover paste was made into smaller fritters with tea the other day. Always shallow fried for convenience as well as health. 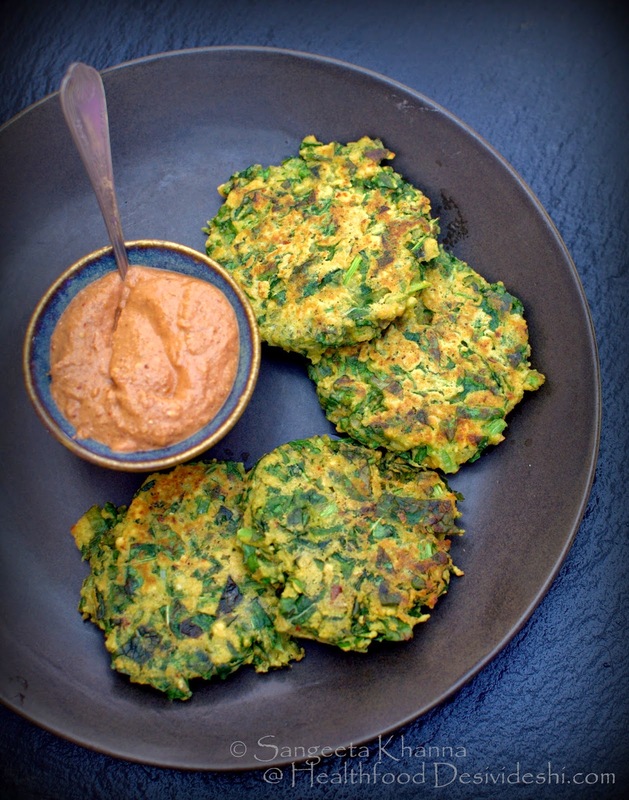 These lentil fritters made with a truckload of fresh greens is a really healthy breakfast or even dinner if you want something quick and healthy. Truckload of greens wouldn't sound like a hyperbole once you would mix the greens with the lentil paste as lentil paste is just used to bind the greens here. This fluffy pancake is made with red lentil paste and rocket leaves that my garden was flooded with last year. Those yellow cherry tomatoes were from the garden to. The dip served with it is a mushroom and caramelized onion dip that I use as a sauce over my steak sometimes too. If not using soaked lentils you can always use besan (chickpeas flour) and sprinkle over chopped greens while massaging them to bind well. This one with spring onions is a favourite as breakfast or an evening tea snack that becomes our dinner sometimes. 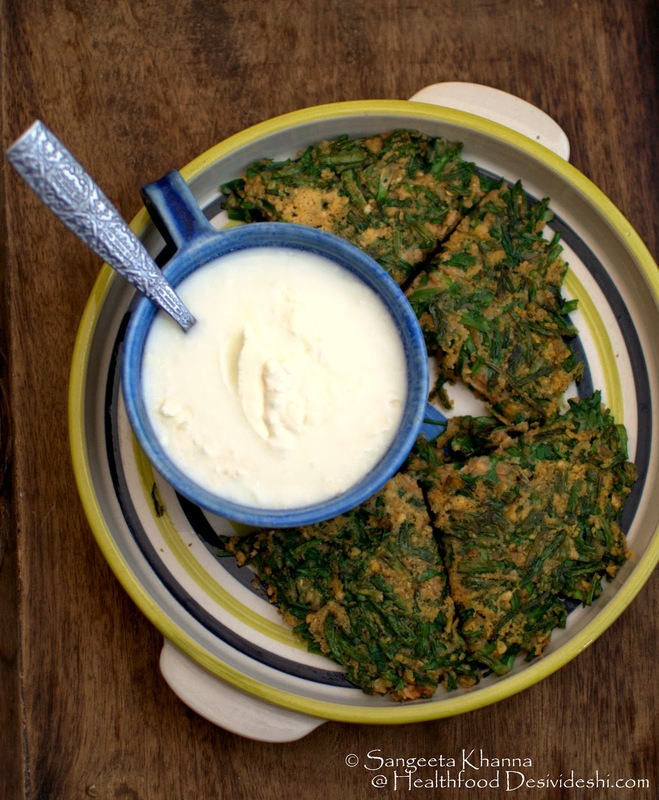 With cabbage it makes easier fritters as cleaning and chopping the cabbage is always easier than other greens. 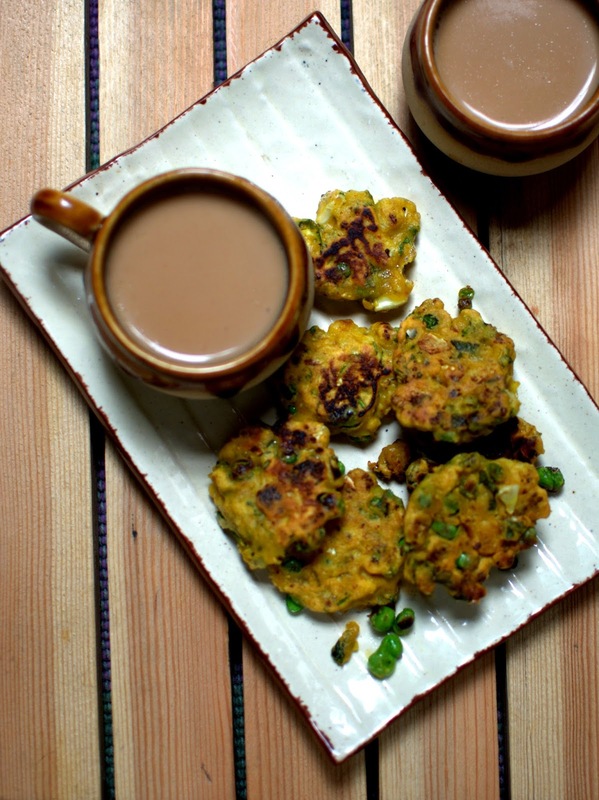 These lentil fritters can be served as starters for an elaborate meal, make them smaller in that case and serve with 2-3 types of chutneys and dips for variety. I sometimes have these fritters along with my dinner soups as well. You see how 100 gm of dry lentils can bind about 300-350 or even 400 gm greens when soaked and blended. More nourishment, lesser dense calories, real fresh food that satiates the taste buds as well as the tummy. Calorie efficient meals to sum up. Each calorie consumed brings in great nourishment with it. What is not there to like. I love it. Good and healthy recipe...love your posts. 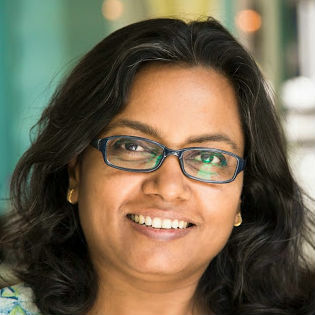 I often visit here for chutney recipes but you got a good collection of various type of dishes and I like your informative write ups. Will post the mushroom and caramelised onion dip very soon. I understand step wise pictures make more sense but it's not always possible when I am cooking in a hurry. Will try in future. The use of masoor daal paste makes the pancakes really fluffy. Try it once and let me know.